I am using MS Word 2003 on Windows XP Pro SP3. Yesterday by looking through my MS Word 2000 book and using some logic I managed to figure out how to password protect an MS Word Doc. I then noticed an "Advanced" button. I clicked on it and saw the Encryption Type options in the attached image. The default is the Office 97/2000 Compatible one. The one at the very bottom (Not seen in the image) is Microsoft Strong Cryptographic Provider. QUESTIONS: Are some better / stronger / more difficult / or even close to impossible to crack than say the default "Office 97/2000 Compatible" one? Will they all be able to be opened up by any and ALL MS Word versions upon entering the correct password? Hi Chimiti, It's some interesting questions you are raising! The default encryption used in applying password protection to a Word 2003 doc is generally considered to be "not very secure at all..."
(there are many tools freely available online to those who know where to look that will " unlock" that protection. Using a more secure type of encryption like for example the final one shown in your last screen dump offers considerably more difficulty for an "attacker"
Using Win Xp means that generally your password will be limited to a maximum of 15 characters..... tricky for a lot of folks to break using simple " brute force attacks", but definitely not impregnable! Backwards and forward compatibility is a different question but here's a good article that may set you on the right course for your research. Good luck with this but in general terms, it's time to ditch both Word 2003 and Win Xp if you wish your docs to remain reasonably secure! For some reason I have not been able to get that link to work for me. Nevertheless, I guess it sounds like I should just use that Microsoft Strong Cryptographic Provider option. I realized after the fact that I guess Docs NOT saved using the default option of Office 97/2000 Compatible will NOT be able to be opened with Office 97/2000. So I guess if I use the Microsoft Strong Cryptographic Provider option I should be OK as long as I stick to MS Word 2003 and above. Anyway, it's not something I was going to be using on the wholesale level. Maybe on 1 or 2 Docs and that's about it. Thanks for the insight, Paws. I just noticed that unlike the default Office 97/2000 option, which has a limit of 15 characters for the password ... that Microsoft Strong Cryptographic Provider that I chose has up to a 128 character (key) limit that is adjustable. So, I went ahead and created a Hulk-sized password with wayyyyy more characters than just 15. I'm not 100% sure, but in looking at the images in my MS Word 2000 book ... MS Word 2000 probably does NOT have the Advanced Encryption options that MS Word 2003 has. Thus, MS Word 2000 probably IS limited to just a 15-character password. Cuz I notice that MS Word 2003 has a separate "Security" tab in the options window where the password stuff is --- vs. the password stuff being in the "Save" tab in MS Word 2000. Edited by Chimiti, 04 April 2019 - 10:46 PM. I think you will find that the 15 character limitation is as a result of using Win XP rather than Word 2003 per se. See if you can get access to the article I linked with.. it does explain quite a lot and provides further links if you want to explore the subject in greater detail. Nope, Paws, for some reason that link just doesn't want to work for me. I even tried the flat simple root "www.groovypost.com" and even that won't work. I just keep getting the same error message that I have attached. Here and there I'll encounter situations like this. What it probably is is that ... I have Dial Up Internet and some websites are not Dial Up friendly and will time out upon encountering any semblance of slowness. No biggie. It would have been good to see it, but if it cannot be loaded, I'll just have to let it be. Edited by Chimiti, 05 April 2019 - 08:21 AM. Not a lot of folks use dial up these days so I guess that could be the issue.... maybe check it out at the library or a chum's house? I FINALLY got it to work. I don't know. It must have been a cyber hairball stuck somewhere. Just by happenstance, I clicked on a link for how to create a bootable USB Flash Drive. 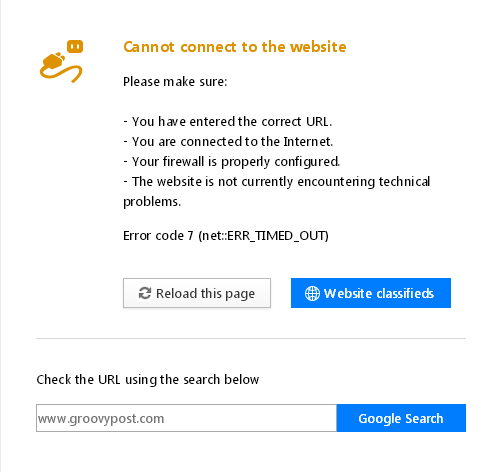 I didn't even know at the time that it happened to be at groovypost.com until it was already open. I thought, "Whoa! How come THIS one opened and the other ones didn't?" I went back to trying out your link and this time it came right up. For whatever reason, the writer of the tutorial there recommended the Microsoft Enhanced RSA and AES Cryptographic Provider encryption option instead of the last one that I had chosen ... the "Strong" one. So I went ahead and changed my Doc's encryption option to the one recommended by the writer. Thanks again for the link and your help, Paws. NOW we'll really declare this issue RESOLVED.